Location can be added as multi location/multi site and department within the industry location. Asset /equipment details can be configured also the system can add the measuring equipment also. 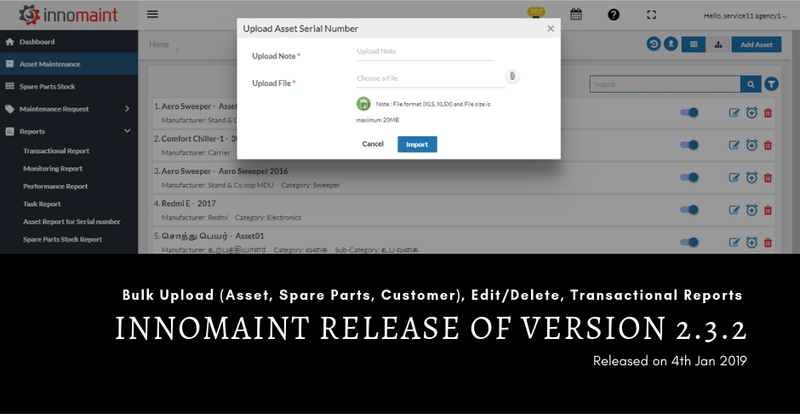 Asset with Serial Number (With Location & Department) – Assets can be added by manufacturer, category, sub categorize and model. Every Asset can have multiple serial number of individual assets. Schedule Bulk Upload – Planned preventive maintenance activity /schedule can be configured through the schedule upload. Inventory Spare Management – Spare parts can be added for the industry as you need, it can be grouped by category and also specific spares suitable for only some model/manufacturer can be configured. Users can be added part of the bulk upload for the service agency flow and user equipment flow. Users can be configured as a Global user or Local user. For Engineers system allows to configure as Employee or Contractor Options. Customers can be added through this bulk upload for Service agency flow. Edit option provided for Assets, Serial numbers, Schedule, Location, User & Contractors. Delete option provided for Assets, Serial numbers, Schedule, Location, User & Contractors. Delete can happen only when there is no Task assigned/in-progress for the Asset/User/ Location etc. Proper error messages provided, If the Delete option not working scenario. Email Consolidation – System will send a consolidation task / allocation report for the current day every day morning and also it sends the consolidated status / completion report notification as email. Spare Parts Categorization – Spare parts can be grouped as Mechanical Spare, Electrical Spare etc based on the customer needs. System allows special characters as a input in all the pages which will support to add multi language as input. User can enter values in their own languages. Task report will have service engineer name, location to give better clarity. The Schedule transaction summary report has been updated with – Total No.Of Schedules, Auto Canceled column. Depart has been updated for applicable reports to segregate the activity by department wise. All the application Labels has been configured as per the customer needs based on their industry standards and their own language. In the Summary report total defect type has been introduced. Transaction summary report has been updated with Pie chart and summary Details. This can be export as PDF and Excel for the reference and it can be shared by email. PDF report can be printed as a hard copy and store it for the audit reference. How Do Faster Service Improve HVAC Business?